America leads the world in wasting food. It’s estimated almost half of all produce in the U.S. is thrown away. 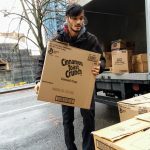 “OSL – Operation Sack Lunch“, a nonprofit in Seattle, is trying to combat that problem by rescuing food before it’s wasted. KBCS’s Casey Martin traced how leftover food from local businesses became meals for the homeless.